“The RMT 6 Step Process to Wealth Management™” is our fundamental step-by-step process that works like a road map on the way to a sound financial future. Since your personal and financial goals change with every milestone, (marriage, saving for college tuition, retirement, etc…), the wealth management process will grow and change with you. 1. Project Your Goals—Having a clear vision of where you want to be is crucial when it comes to achieving your retirement and other personal goals. In fact, your goals are the driving force behind our recommendations and strategies. 2. Evaluate Your Assets—In step 2, we’ll need to evaluate your current assets, your investment accounts, insurance, and real estate holdings. Asset evaluation will help you understand where you are currently, to where you want to be 5, 10, even 25 years from now. 4. Provide Options—Now that you understand where you want to go and what you need to get there, we will provide you with a detailed and comprehensive financial plan on your investment options. 5. Implement Strategies—Now it’s time to activate your portfolio plan through asset allocation, tax planning, and estate planning. Since it’s essential to have a thorough understanding of the risks and rewards of your investments, you’ll be given as much information as possible, and we’ll be ready to answer any questions you may have. 6. 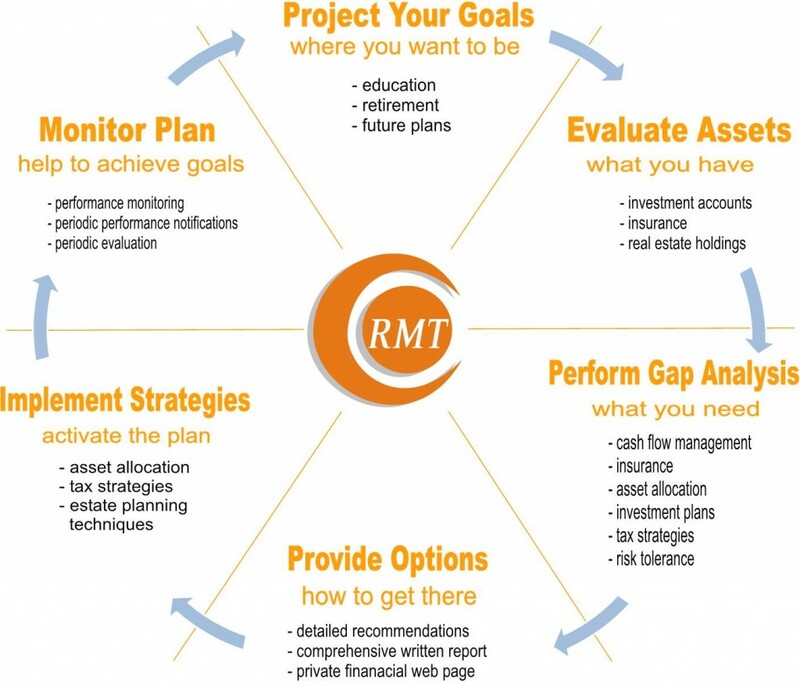 Monitor Plan—At RMT Wealth Management we have systems in place to help you monitor the progress of your portfolio. You will be notified whenever your account is up or down by a certain percentage point. In addition, you will receive periodic evaluations, and we’ll have an annual meeting to discuss your account performance and make any necessary adjustments. You’ll even be given a private financial web page where you can monitor your portfolio. Rest assured confidentiality is our top priority, so your personal and financial information is safe with us. No matter what your vision of the future is, Robert Troyano CFP®, CPA and his team at RMT Wealth Management will help you to create a personalized financial plan based on your goals. If you’re ready to experience the RMT difference, then contact Robert Troyano CFP®, CPA today for your complimentary, no-obligation 60 minute wealth management consultation. The above listed steps are a process, not a solution and are provided as a general guide. It can help you reach your financial goals by evaluating your overall financial circumstance, then outlining strategies that are tailored to your individual needs. There is no guarantee, however, that any particular strategy will work under all market conditions. You should carefully consider your investment objectives, risk tolerance, liquidity preference and time horizon before investing.